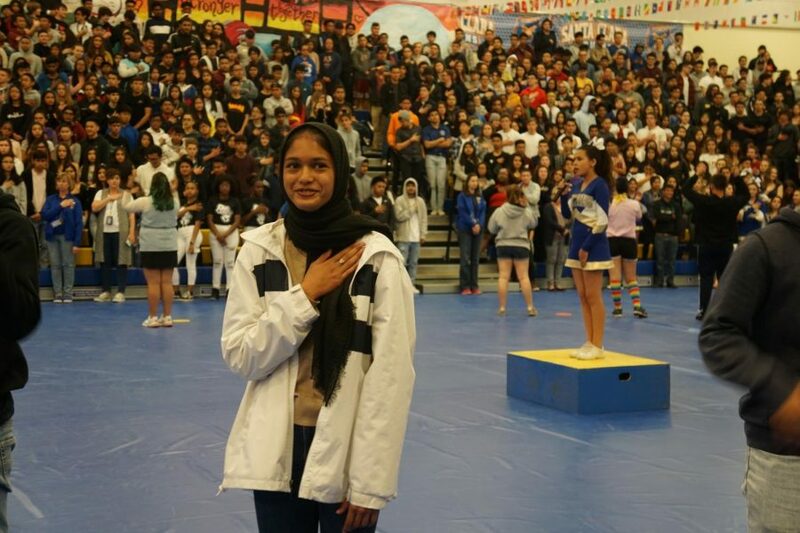 Sophomore Saahar Khan signs the National Anthem in American Sign Language. 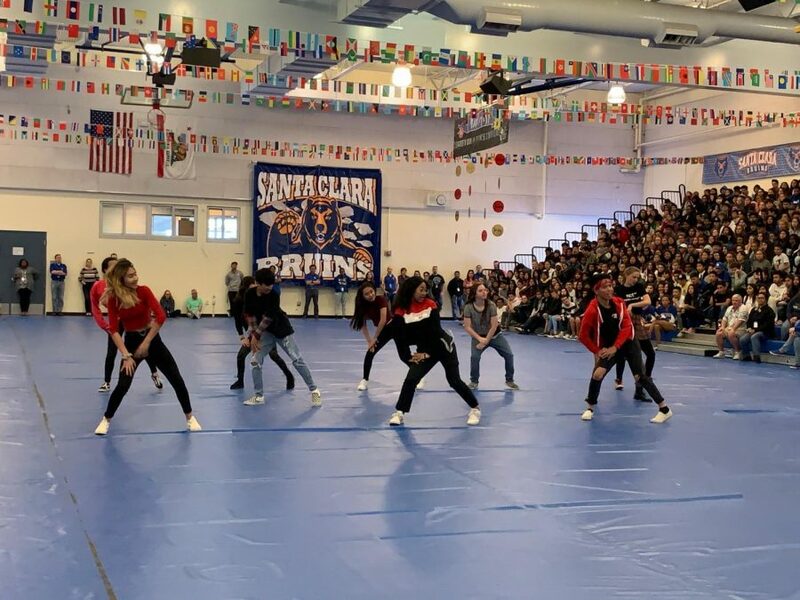 This year, Santa Clara High School’s annual second semester renaissance rally was replaced by a Diversity Rally, on Friday Apr. 12, preceded by a week-long celebration of the many cultures at SCHS. The week and rally come with a theme – “Here, I am at home” – that is presented in the style of a movie. The idea is that if SCHS were a film, it would be filled with variety. 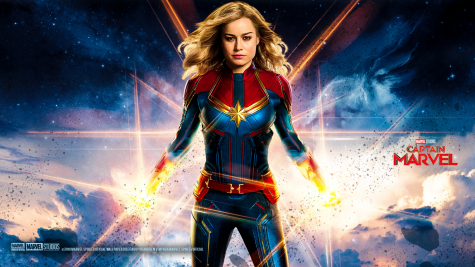 “If we wanted to make a movie of Santa Clara High School, it would be very diverse and it would have diverse characters,” junior Events Coordinator Eva Kwiatkowski said. The week was filled with ethnic cafeteria food, traditional dance performances at lunch and a Club Faire on Thursday, Apr. 11, where different nationalities’ foods were sold. According Kwiatkowski, these were all ways for students to learn more about different cultures and possibly join a club. The Heritage Ethnicity And Race Together (HEART) club, put together a challenge for students to participate in during the week. It consisted of five activities: “History fact, Eat, Adventure, Rock the look and Translate.” According to senior Madison Kohls, the cofounder of the club, this was an opportunity to help students learn about their own heritage. “I created the HEART Challenge as a way for students at SCHS to get more in touch with their culture because I found that I knew literally nothing about my own cultures, German and Vietnamese, and some students are probably in the same boat as me,” Kohls said. Various clubs and groups performed at Friday’s rally to celebrate diversity. The event opened with Concert Choirs 1 and 2 combining to sing “Thula Klizeo,” a Zulu song with the lyrics “Here I am at home” included. The National Anthem was sung by freshman Sophia Rodriguez, who was accompanied by ASL students signing along. Kohls created a video compilation of diverse students participating in her HEART challenge. The video got many laughs, as it was done in the style of a YouTube video, with many pop-culture references. The rest of the rally featured cultural dances that combined modern and traditional music to give everyone a piece of home. Senior and president of the Black Student Union, Bathsheba Aklilu, said these performances created a familiar feeling for many. Some dancers felt that their routines helped them to learn more about their heritage. “I really got to better understand my culture and I got to bond with all different kinds of people,” freshman and Filipino American Student Association member Aceben Agustin said. Even staff members felt represented, with Biology teacher Risha Shah dancing alongside students in the Desi Student Association performance. The rally allowed students who didn’t know about certain cultures to learn about them in an amusing way, according to sophomore Meghan Van. Weaved in between dances, clubs were recognized for their hard work and dedication to diversity. After the acts, ASB President Sofia Kritikopoulos and Vice President Jonathan Vergonio gave a speech about the many colors at SCHS. The front of the gym was lit with an array of colorful lights, as Kritikopoulos and Vergonio talked about how SCHS was a watercolor of diverse students. A lighthearted video by junior Sean Nguyen ended the event. It featured snippets of students and staff around school with text that said “Santa Clara High School is your home” in different languages. Many students felt that the Diversity week and rally this year was a fun and unique way for students to be seen. Dance group Snap, Crackle, Pop performs to K-pop.